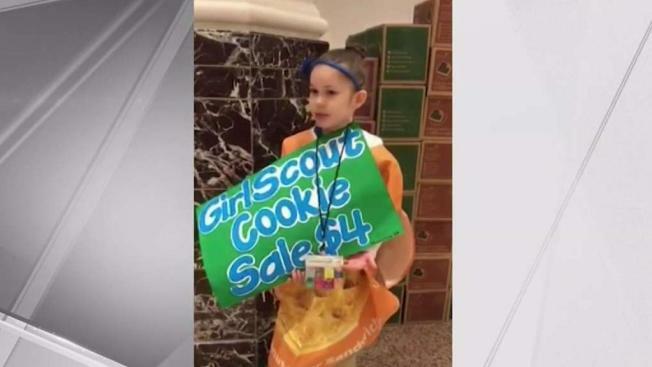 Authorities say thieves stole more than $1,000 from a group of Girl Scouts who were selling cookies at a New Jersey mall. Gaby Acevedo reports. A New Jersey Girl Scouts troop leader was removed from her position Wednesday after authorities say her previously reported theft of more than $1,000 in cookie money sales inside a Garden State mall earlier this month never actually happened. Girl Scouts of Central and Southern New Jersey said they decided to remove Troop 80062 leader Jessica Medina from her volunteer position. It was back on Jan. 18 when Medina told police that two thieves swiped $500 in cash and several checks from a bank envelope left unattended on a table where members of Troop 80062 were making their cookie sales at Woodbridge Center Mall. The blame was initially pointed at a man, possibly wearing a disguise, and a woman using a red walker, police said. Police later interviewed the duo and eliminated them as suspects while also determining the alleged theft, which was first said to have been recorded on surveillance video in the mall, was in fact never captured on video. After interviewing parents, troop members and witnesses at the cookie sale event that day, police said the envelope was never on the display table at any time, but rather secured inside a cash box. When police interviewed Medina again, they claim she changed her story, claiming the missing cash wasn’t from the cookie sale, but instead was “previously submitted by the Girl Scouts to pay for scouting events such as roller skating and the Daddy-Daughter dance,” police said in their statement. Police said she claimed she was planning on taking it to the bank. The GSCSNJ said the main focus now is to help the girls move forward with their cookie season.